Billboards at IGI Airport (Terminal 3), showing connectivity to Airport Metro Express. Photo by Amit Bhatt. Umang Jain co-wrote this post. 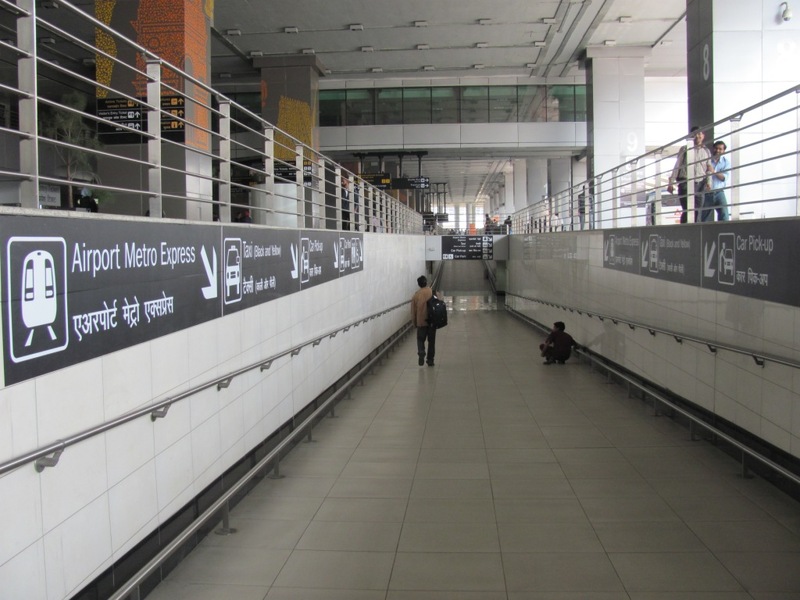 On February 23, India launched the Delhi Airport Metro Express (DAME), a first-of-its-kind metro rail service connecting New Delhi Railway Station (Central Delhi) to Indira Gandhi International Airport. The project has been implemented using a Public Private Partnership (PPP) model by the Delhi Metro Rail Corporation Ltd. (DMRC). The Delhi Airport Metro Express is one of the latest examples of using the PPP model to develop urban transport infrastructure in India. In order to improve the viability of the project, the construction cost has been borne by DMRC and the facility is leased out to a private company for operations and maintenance. The present ridership of about 6,000 passengers per day—or 15 percent of the operational capacity—is very low. However, this is expected to increase with time. Achieving high ridership numbers in the near future will be vital, as it will not only affect the financial performance of this particular project but will also impact the viability of similar projects in other Indian cities. The total length of the line is 22.7 kilometers, of which 15.7 kilometers are underground and the remaining 7 kilometers are elevated. The cost of construction is reported to be approximately Rs. 5,700 crore (US $1.24 billion.) The line has six stations: New Delhi (near the railway station), Shivaji Stadium, Dhaula Kuan, Delhi Aerocity, IGI Airport and Dwarka Sec 21. Two stations, New Delhi and Shivaji Stadium, will have City Airport Terminal (CAT) facilities, meaning passengers can purchase tickets and check in with their baggage. These facilities were yet to be in service at the time of launch. Two stations on the line, Dhaula Kuan and Delhi Aerocity, are not operational, yet, but they will be soon. Pedestrian passage at Airport (Terminal 3), connecting Airport Metro Express. Photo by Amit Bhatt. The PPP is organized around an operations and maintenance contract. DMRC, using public funds, was responsible for all the civil work on the project and a consortium of private companies comprising Reliance Infrastructure Limited of India and Construccionesy Auxiliar de Ferrocarriles, S.A. (CAF) of Spain, which was selected as the concessionaire for operation and maintenance of the facility. The consortium subsequently incorporated as the Delhi Airport Metro Express Private Limited (DAMEPL), a Special Purpose Vehicle (SPV) company with a 95 percent equity stake from Reliance Infrastructure Limited and the remaining 5 percent from the Spanish firm. As per the terms of the contract, DEMEPL will pay DMRC a fixed concession fee of Rs. 51 crore (US $11 million) per year along with a share of the gross revenue, which is pegged at 1 percent for the first 5 years, 2 percent for years 6 to 10, 3 percent for years 11 to 15, and 5 percent thereafter. In addition to collecting fare box revenue, the concessionaire has the right to develop commercial real estate at the six stations along the line. Eight six-coach trains are deployed for operation and each coach has a capacity of 60 passengers. Initially, the service was planned to operate 24 hours per day with a frequency of 10 minutes. Currently, however, train services operate from 6:00 a.m. to 10:00 p.m. with a frequency of 20 minutes. After two weeks of operations, the daily ridership is reported to be about 6,000 passengers per day, which is about 15 percent of total daily capacity. 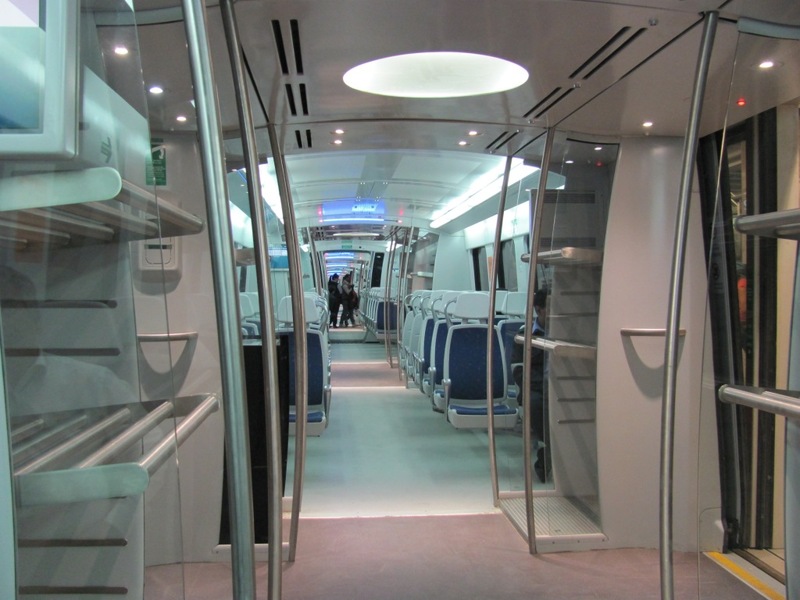 A view of the Airport Metro Express coach. Photo by Amit Bhatt. The inaugural fare has been fixed at Rs. 80 (US $1.74) to travel from New Delhi station to IGI Airport and Rs. 100 (US $2.17) from New Delhi to Dwarka Sector 21 (the last stop.) This is about four times more expensive than using a bus to travel a similar route, but about four times cheaper than using a taxi. In the city, the Delhi Airport Metro Express Station is conveniently located opposite the New Delhi Railway Station complex on the Ajmeri Gate side. The station is also physically integrated with the other DMRC Station at the same location. 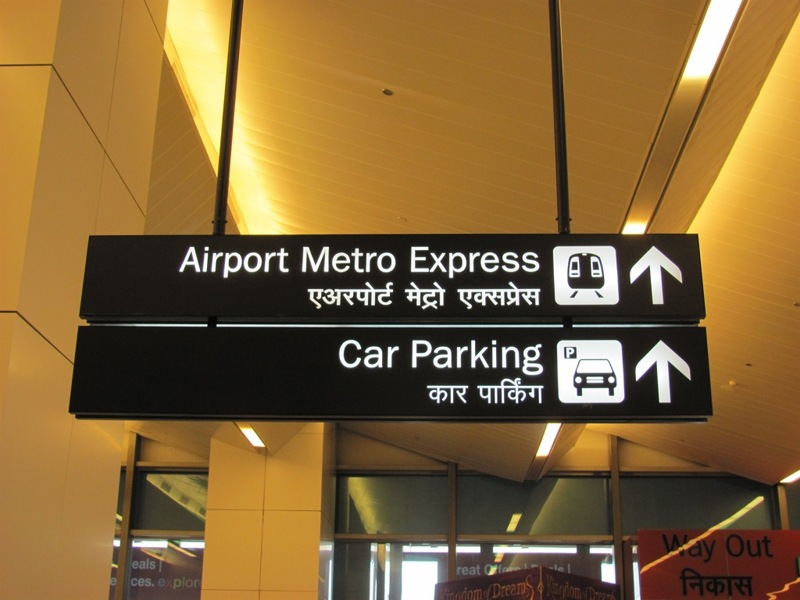 At the airport, the Delhi Airport Metro Express station is located at a walkable distance from Terminal 3. The station is linked to the terminal building through a passenger walkway. However, connectivity to terminal 1D, which caters to all the low-cost airlines, is a major issue. Passengers need to take a bus or taxi from the metro stop to the terminal. Passengers going to Terminal 1D can also use the shuttle bus service from the metro stop, but this service is not available for visitors. Another important issue with the express line is that it is not integrated with the DMRC line. This means that a passenger wishing to transfer from the Airport Express line to a regular Delhi Metro line would need to buy tickets again. 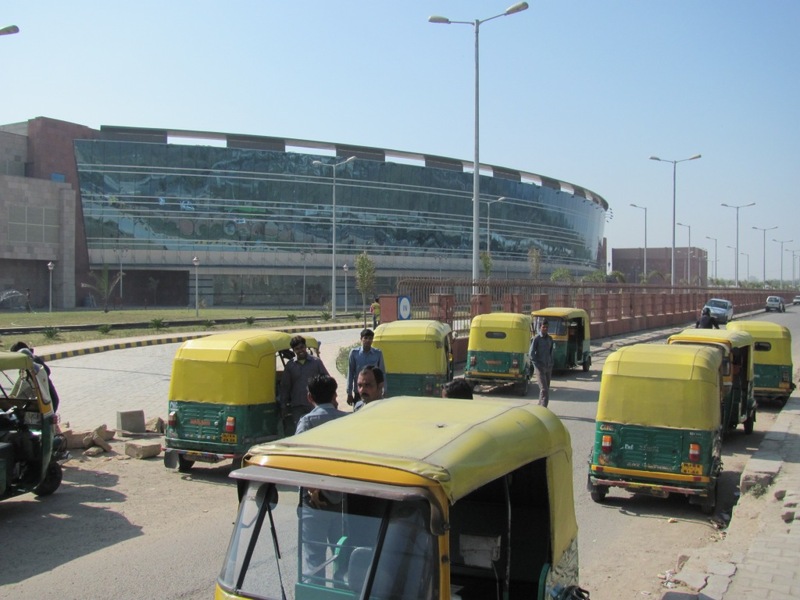 Auto rickshaws outside Dwarka Sector 21 station. Photo by Amit Bhatt.